Anyone with a Nintendo Switch in their hands will be able to become, well, a legendary virtuoso as promised in the title in upcoming music title Pianista: The Legendary Virtuoso. Touted as being a high-end music game designed specifically with the console in mind. There are three different modes to choose from for your next concert: Matinee, Concours, and Ensemble. In Matinee, choose either four or six keys and then three songs to play. Clearing special missions reveal hidden stages. The Concours mode packages challenges by theme, with varying difficulties. 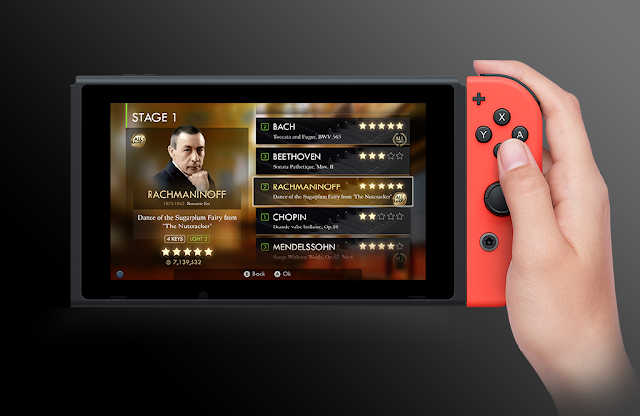 Ensemble brings another player to the piano, using the Joy-Cons to play a duet. You can mix skins, music speed, and more to create the best duet possible. Pianista: The Legendary Virtuoso is developed by Superb Corp. out of Korea. And guess what: it's available now via the eShop!